BACKTOFRANKBLACK.COM: The Truth Is Out There? This site is dedicated to the return of FBI criminal profiler Frank Black but there are obviously other members of the 1013 family that we support as well. Alongside our campaign for a new Millennium movie, our brothers and sisters over at Xfilesnews.com have been fighting the good fight for a third X-Files film. Needless to say, many Millennium fans are also fans of The X-Files, and vice versa. Well, today Back to Frank Black was contacted by Tiffany Devol who passed on some very encouraging news from a French source. "It is being written. One awaits just the green light from Fox, a little disappointed from the relatively poor reception of the second film. The error comes, in my opinion, that the authors strayed too far from the roots of the series. Moreover, the film was released in the summer. The third will be much closer to what the public expects, with government conspiracies, etc. " 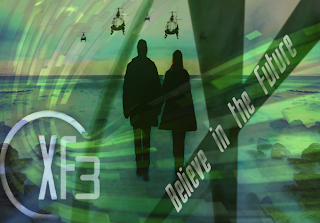 XFilesNews has been campaigning for a third film since the release of The X-Files: I Want to Believe in 2008 and launched the Believe in the Future campaign to convince Fox to green light by 2012. Let's help support the fine folks at Xfilesnews.com and their pursuit of a new X-Files film. Remember, this could also help us in our cause for a Millennium film! 0 Responses to "The Truth Is Out There?"